Carnegie Magic and The Steampunk Illusionist: Steampunk Frankenstein, Sort of. I just watched the movie Victor Frankenstein, starring James McAvoy and Daniel Radcliffe. I had been waiting for it to come out and never noticed it at the theatre. To my surprise I found it on iTunes, so I quickly rented it. Before I tell you my thoughts, I must tell you that after watching the movie I looked up the various reviews of the movie, all of which were bad. I couldn't find any critics that liked the movie and some had some pretty disparaging things to say about it. What did I think? I rather enjoyed the movie. I thought the 'origin' story was a fun departure from the regular remakes of the same story. It was a bit over the top, but I was not expecting to see an Oscar winner. Rather, I had hoped it would just be good fun, and for the most part it was. Daniel Radcliffe plays Igor and starts out as a hunchbacked clown in the circus who has a fascination with anatomy and medicine. Yeah, a bit far fetched, but I thought it worked with this overall crazy concept. James McAvoy, plays Victor Frankenstein, not yet a doctor. He is in medical school, but busy conducting experiments in his off hours. He is more interested in his experiments than the information he gains at school. His house and lab are a steampunk dream. Many cool gadgets and gizmos as well as gears, cogs and wild Victorian contraptions to delight! If you are a purist and either stick firmly to the Mary Shelly original story or the Boris Karloff movie, then you might not like this movie. 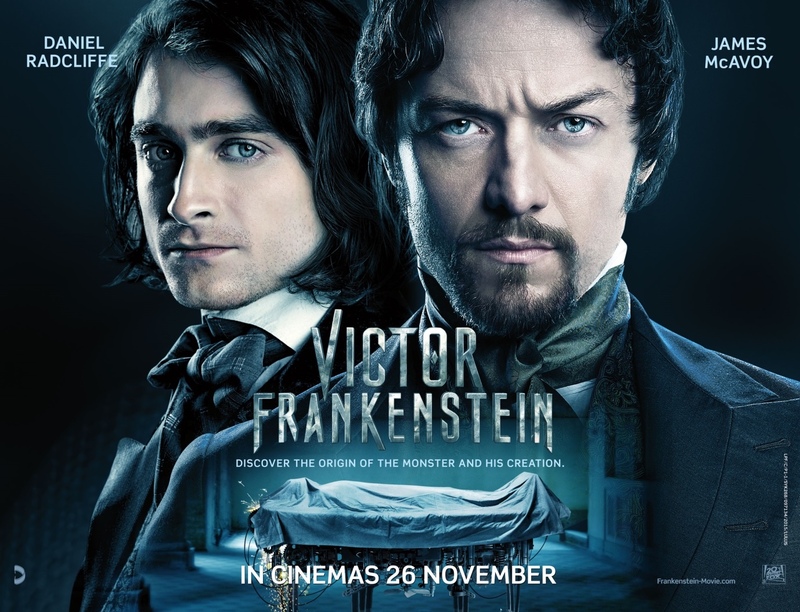 But if you're open having some fun, check out Victor Frankenstein. You may just enjoy this new version of a very old story.